A small loader with a trencher attachment is perfect for precision cuts and small utility runs on crowded jobsites. 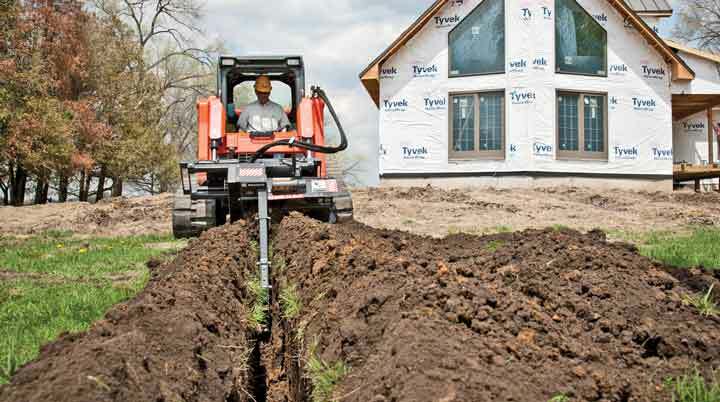 Dig trenches for utility and irrigation systems or power and water lines. Trench close to buildings, walls, fences and other objects, and do it with a machine you already have in your fleet (a skid steer or compact track loader). Founded in 1981 and servicing customers around the globe, Digga’s Bigfoot and Hydrive trencher implements slice soil with the best in the industry. These folks are also ready to answer the many questions you may have. 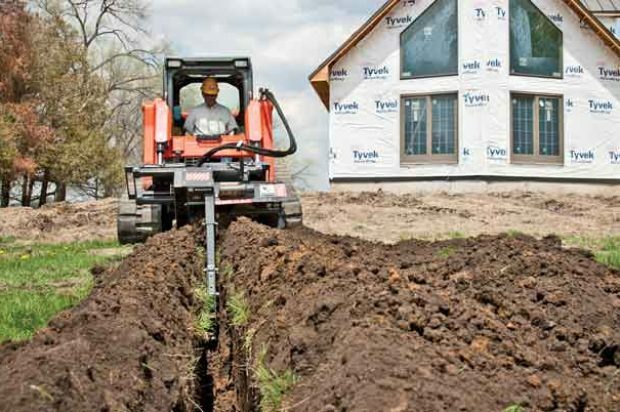 When trenching holes through tough terra firma, it’s important to find a balanced trenching attachment for your application, and it’s always good to have options. One of the most important things to consider is the trencher’s depth. • Light- to medium-duty trenching jobs most likely require a standard-flow attachment with a 2- to 3-ft dig depth. • Medium- to heavy-duty trenching jobs most likely require a 4- to 5-ft dig depth trencher, which usually comes standard with manual side-shift and may feature high flow as an option. • Heavy-duty trenching jobs definitely need a 3- to 5-ft dig depth trencher, which often feature hydraulic side-shift for trenching close to buildings, dual augers to move spoil away from the trench and high-flow hydraulics to cut with aggression. Typical flow and pressure requirements for small skid steers range from 8 to 20 gpm with hydraulic pressures ranging from 1,750 to 3,000 psi. Typical flow and pressure requirements for mid-size to large skid steers or track loaders range from 10 to 42 gpm with hydraulic pressures ranging from 2,000 to 4,200 psi. • Tooth every station (TES): This chain is designed for standard digging conditions, light to moderately compacted, sandy, loam soils and loosely packed gravelly soils. • Tooth every other station (TEOS): This tooth pattern is designed to give the most production in wet, sticky conditions such as gumbo, wet clay, etc. • Rock and frost (50/50): This chain is for extreme rock conditions or to complete service work when temperatures are not so favorable. The rock and frost chain will give the highest production in frozen ground, highly compacted soils and rock, allowing the cup teeth to pick up and clean the trench. This chain is very aggressive in tough conditions but is not as productive in the lighter, normal digging conditions. • Shark tooth chain (70/30): This chain should be applied in compacted soils, light frozen ground, baked hard clay, shale or rocky soils. The aggressive shark teeth will slice, break and relieve the tough soils, allowing the cup teeth to follow and clean the trench. As with the rock and frost chain, the 70/30 chain will not be as productive in the lighter, normal conditions as the TES chain. • Full shark tooth chain (100 percent): This chain is recommended in fracturable rock, shale, caliche or conditions with little or no loose soil. Chain sizes for trenchers are quite varied too, depending on the type of soil, depth desired and application or end-result you are looking for. They usually vary from 6- to 12-in. widths and from 24- to 60-in. depths. The 6-in. wide chain can dig depths from 24 in. up to 60 in. Generally speaking, the wider the width, the less depth that can be achieved. The 8-in. wide chain will dig depths of 36 and 48 in., and 10- to 12-in. wide chains typically dig depths up to 36 in. Most trencher manufacturers offer many features and benefits. For starters, look for the highest quality hydraulic motor amplified by a bullet-proof planetary gearbox. Some units feature direct motor drives and others feature chain reduction drives. Direct drives often offer more chain speed but lose out in long-term durability and the all-important area of torque. Heavy-duty chain reduction drives (similar to those that propel skid steer loaders) offer a dependable and economical method of maximizing digging power at an affordable cost. Look for trenchers that have augers designed with a large diameter; these move material from the side of the trench, limiting the amount of spoil falling back into the trench. Make sure there is quick and easy access to the grease cylinder for tensioning the chain. Ask about the crumber; standard on most trencher models, these help to remove soil from the trench and provide a clean, smooth trench bottom. Also, does the trencher have reverse rotation? Is it capable of reversing the chain direction, and does it stall when reversing? Then, ask about side-shift, which provides attachment flexibility when working next to a building or objects. Manual and hydraulic side-shift are usually available, depending on the model. 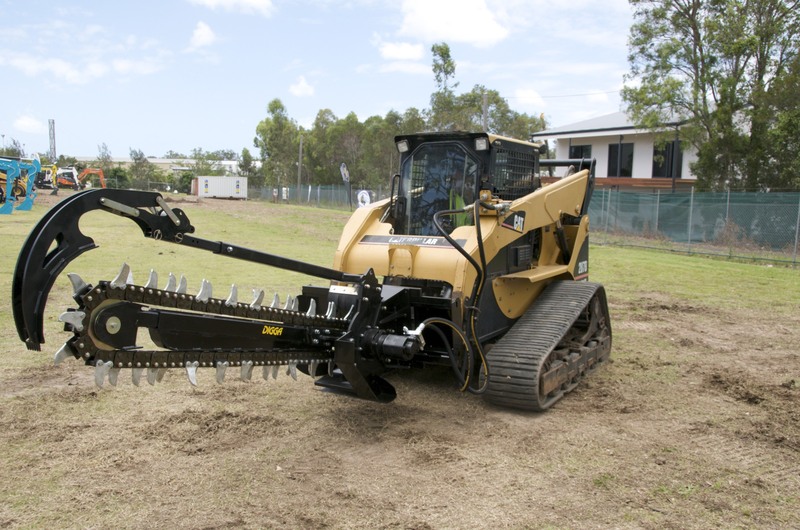 Trencher attachments are one of the most common tools you can attach to your skid steer or track loader, which is good news because that means there are lots of options. Just make sure you know how to operate it.